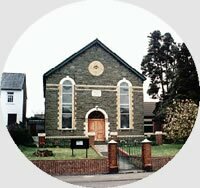 There are 35 Churches in Wales which are affiliated to the Congregational Federation. A further 24 unaffiliated English Speaking Congregational Churches have some links to the Federation through the 'Unaffiliated Congregational Churches Charities'. Federation member Churches are shown in green and unaffiliated Churches are shown in blue. 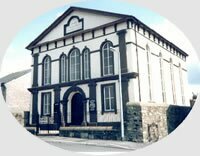 BRITON FERRY : Now meeting in Bethesda Welsh Independent Chapel, Cwrt Sart. Services at 3.00 p.m.
DOWLAIS : Ivor, Ivor Street, Services at 11 a.m. and 6 p.m.
HIRWAUN : Mount Pleasant. Service at 3.00 p.m.
RHOSGOCH, NEAR PAINSCASTLE : Hermon, Services at 2:30pm alternate Sundays, 6pm alternate Sundays.